Possibly a variant or sport of T. Fuego, cv. ionantha, P.Isley 2010. From BCR "Mature, upright, small rosette to 5 cms. diameter x 10cms. high. Foliage base colour silvery grey/green suffused with coral red upper leaf portions in strong light. Possibly a variant or sport of T. 'Fuego' due to the size, shape and leaf sheen. 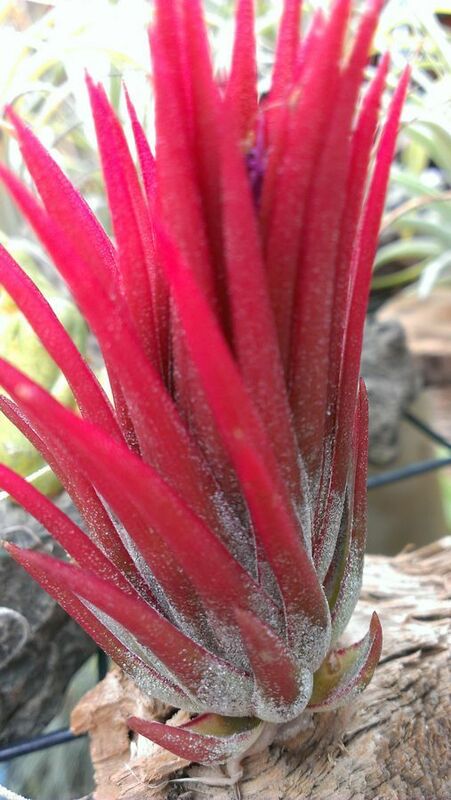 Arose in 2010 in T. ionantha stocks at Rainforest Flora Inc. Nursery, Los Angeles. Ionantha Group. Reg. Doc. 1/2015. California USA." Kerry McNicol 12/14, ex. Chris Larson.